SAN FRANCISCO (AP) -- Hewlett-Packard Co. is expecting earnings to fall by more than 10 percent next year as CEO Meg Whitman struggles to fix a wide range of problems in a weakening economy. Whitman delivered the disappointing forecast Wednesday at a meeting that the ailing Silicon Valley pioneer held for analysts and investors. 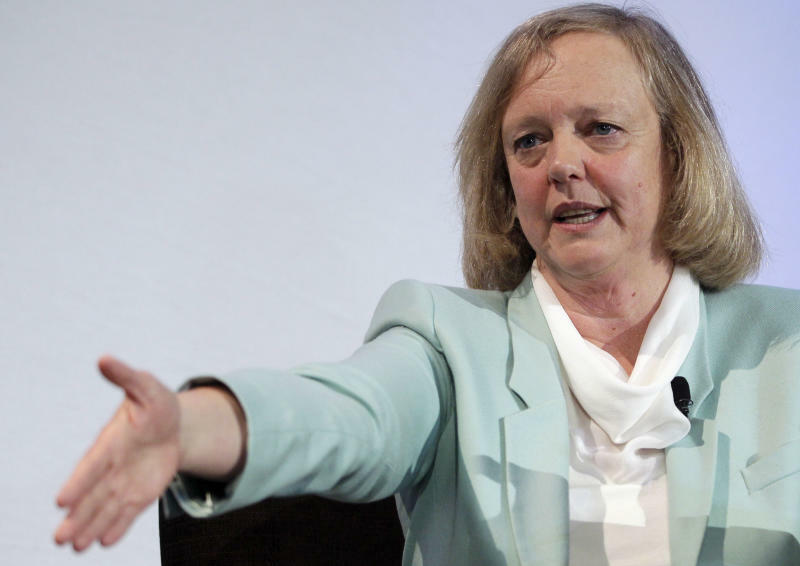 The gathering gave Whitman the opportunity to persuade investors that she has come up with a compelling strategy for turning around HP one year after being named CEO. She said she inherited a bloated company that hasn't been innovating quickly enough in any of its divisions, which span from personal computers and printers to software and data storage. The headaches are so severe that Whitman believes HP's revenue growth might not accelerate again until 2015. "It is going to take longer to right this ship than any of us would like," Whitman said. Following the remarks, HP's stock price shed $1.19, or 7 percent, to $15.94 in afternoon trading. The sell-off shoved HP's shares to their lowest level in nearly a decade. The stock has fallen by about 30 percent since the former CEO of eBay Inc. took over HP last September. HP, which is based in Palo Alto, Calif., expects its earnings for fiscal 2013 to range from $3.40 to $3.60 per share, after stripping out charges for layoffs and other accounting measures unrelated to its ongoing business. The projection translates into an 11 percent to 16 percent drop from the adjusted earnings of $4.06 per share that HP expects to deliver in its current fiscal year ending Oct. 31. Whitman's forecast for next year caught investors off guard because analysts, on average, had predicted HP's adjusted earnings would be $4.17 per share. Next year's revenue also will decrease, although HP didn't say by how much. The biggest problems will be concentrated in HP's technology consulting division, where revenue is expected to fall by 11 percent to 13 percent next year. Technology consulting also faltered during the past year, prompting HP to absorb an $8 billion charge to account for the diminished value of Electronic Data Systems, which HP bought for $13 billion in 2008. In an effort to maintain its profits, HP is in the process of eliminating 29,000 jobs through employee buyouts, attrition and layoffs.